We recently shared a news about Rockstar’s upcoming remastered version of last-gen’s award-winning, most critically acclaimed open world action-adventure video game title known as GTA V, highlighting that it would be the biggest PlayStation 4 game so far with its 50GB minimum HDD space requirement. Now, it seems like that was not all. If GTA V’s European PSN pre-order listing is to be believed, the game will allegedly launch on PlayStation 4 two weeks before its Xbox One counterpart, and will come packed with some exclusive pre-order bonus content. Rockstar is revamping its last-gen, all-time-hit open world action-packed video game called GTA V for PC and the latest PlayStation 4 and Xbox One consoles, but it looks like the publisher of the game is planning to give a special treatment to the users of Sony’s latest video game console. Recently, it was discovered from an early pre-order listing that was accidentally posted on European PlayStation Store that the next-gen GTA V will be the biggest title on PlayStation 4 so far in terms of save size. Sony had to remove the listing shortly after the sighting but some users managed to pre-order the title before the listing was taken down. According to GamePlane, those users who managed to pre-order GTA V with their PSN accounts are now reporting that despite the pre-order listing now gone, the game is still showing up in their download queue, and the launch date that is being displayed is November 4, which is exactly two weeks before the November 18 release date that Rockstar has officially confirmed for both the latest consoles. This allegedly means that GTA V will launch on the PlayStation 4 console two weeks before the Xbox One as timed-exclusive. Below is a screenshot of a German PSN account showing GTA V in download queue. That is not all, some pre-order bonus content that will be given exclusively to PlayStation 4 users was also listed. Besides the in-game GTA Online cash bonus that was revealed recently, another multiplayer bonus along with two other special bonuses for the digitally pre-ordered GTA V were listed. 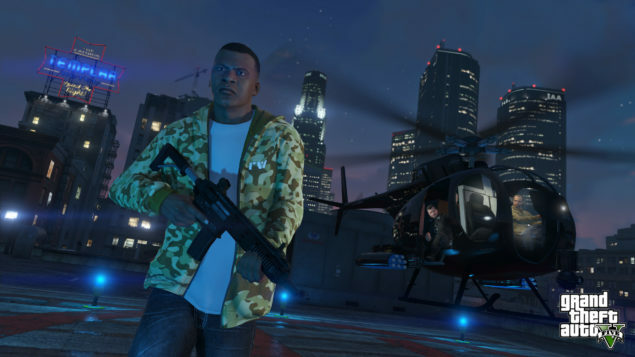 You can check out the screenshot here, which lists PlayStation 4 exclusive GTA V bonus content. Of course, all this should be taken with a huge grain of salt for now as Rockstar or Sony has not made any sort of official confirmation regarding this matter. This could most possibly be an error that Sony will fix, but it could also be something valid. The official release date for the next-gen GTA V for PlayStation 4 and Xbox One is currently November 18, and January 27 for PC. Stay tuned as we will update the story if an official statement is provided.